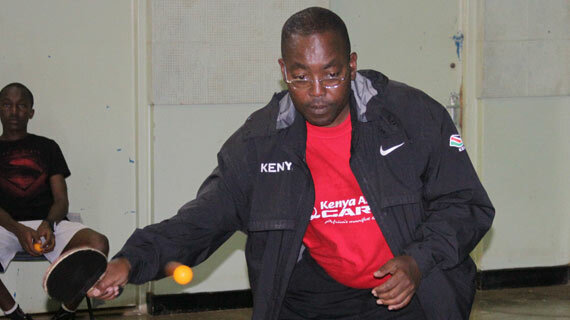 Veteran Anthony Mathenge picked up from his loss to the youthful junior player Peter Theuri in the Commonwealth Games Table Tennis trials to book his ticket to the games. Mathenge could only watch as Peter Theuri who is a student from Makini School over powered him with strong drives to defeat Kenya's top player 3-1. This was the only match that Mathenge lost in the National team trials that saw a total of 20 Men compete for the three slots up for grabs. In the Ladies category, Jinita Shah from Mombasa was all smiles as she destroyed all players in her path including the much experienced Sejal Chandarana and won all her matches to take the top position. It was a sad day for former Kenyan International John Ojiambo who tied on points with Peter Theuri and Mike Otieno as he was knocked out of the team due to a poor wins ratio that cost him dearly, that saw both Mike and Peter jump ahead of him to sail into the team. For Mike Otieno, Peter Theuri and Della Njani it was a breath of fresh air for them as they finally record their presence in the National team as junior players who have excelled in local and regional events and are definitely the future top players of the sport. The trials for the games as held after three qualifying tournaments that players had to participate to accumulate points so that they could make the cut off for the games trials.